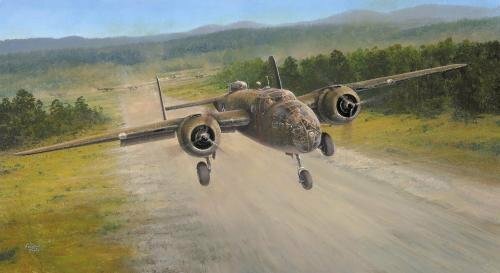 Richard’s new painting shows Royce’s 5th AirForce B-25C Mitchell taking off from the Del Monte staging field on the island of Mindanao on Sunday 12 April 1942, almost a week before the Doolittle raid, en-route to hit the harbor and shipping targets at Cebu. In the three days of Royce’s raids, the Mitchells flew over twenty sorties, sinking and seriously damaging three Japanese transport ships, and shooting down three enemy fighters. 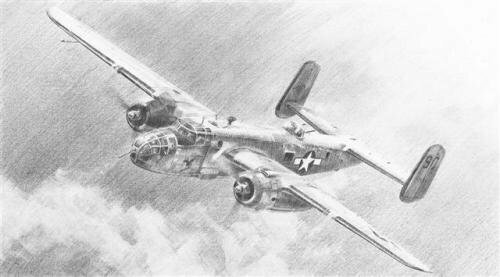 In a triumph of surprise aerial strikes, all seven B-25s and their crews returned safely to base. Though somewhat eclipsed by the publicity following Doolittles attack on Tokyo, the Royce raids were none-the-less courageous and inflicted extensive physical damage on the enemy. Vernon Main is one of only two surviving veterans of the Royce mission, and is joined in signing each print by the artist Richard Taylor. Richard Taylor’s superb pencil remarques have, in the short period of time that he has been published by the Military Gallery, evolved into highly skilled pieces of original art. Extremely detailed, these beautiful hand-crafted drawings are becoming so appreciated by collectors, that they are increasingly in high demand. Two highly restricted remarque editions of THE ROYCE RAID will be issued by The Military Gallery; the first, limited to 25 copies, will each have an ORIGINAL pencil drawing elegantly hand drawn by Richard Taylor. The second, restricted to just TEN COPIES, will be issued with either a DOUBLE SIZE remarque drawing, or TWO seperate and individual remarques.